These cages can be used for giant rabbits, for a litter of babies or if your like me you just want to give your bunnies plenty of room. There will be plans for 2 different cages. The first cage I'm making will be the same size as the one's I'm already using. The next 2 that I'll be making will be a little smaller. There going to sit beside the door to the bunny stall and the doors to 2 other cages, I think I'll have to modify the cage doors to slide up when opening. All 3 cages will have built in hay mangers but will not have nest boxes. If I wanted to use them for birthing cages I will have to make nest boxes. Shopping for wire was interesting. It should be noted that we use 2 different types of wire on our cages, 1/2"x 1" for the bottom and 1"x2" on the sides/top. TSC, in Wilmington, didn't have the greatest selection and what they did have they were out of. (I ended up getting the wrong wire and taking it back) Then I went to Lowe's, also in Wilmington. They had a much better selection however they were almost as sparse in the amount they actually had in stock. So I got what I thought might work. 1/2"x1" roll 10' in length, 1"x2" roll 15' in length, and a roll that starts at the bottom 1"x4" the openings gradually winded to 4"x4" at the top (50' in length). I spent $80. I was hoping to build all 3 cages for less then $20 . . . . . However if the wire with the larger holes works out I'll be able to build 5 or more cages. Oh, and my dad bought some wire for me to use. Its 1"x2" and (I think) 25' in length. So we're up to $106.99, 4 rolls of wire and a bunch of J-clips. 1 piece of 24"x40" wire for the bottom, the holes were 1"x.5"
1 piece of 24"x32" wire for the bottom, the holes were 1"x.5"
1 piece 4x3 for the door, 1"x2"
I connected all of the pieces together with J clips. For the pellet feeder, you'll want to cut a slot out of your middle section and wire it up before you attach it to the floor. Connect the middle to the floor next, to make life easier. Attach the side closest to the middle section, the last side piece, back and then top. Clip the front to the rest of the cage. Next attach the door to the front section, add a latch and your good to go. In hind site I would tweak the design just a little if the cages were going to be up against each other. 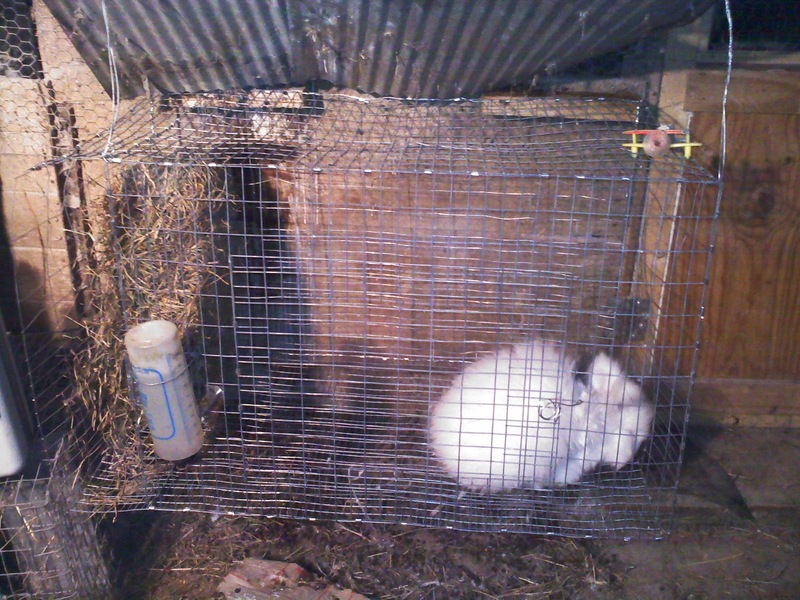 I would make it one very large cage with 2 rabbit holes and a hay manger in the middle. One small package of J clips is not enough for 2 cages. This is the slightly larger cage. You can't see the pellet feeder, its there hidden by the water bottle. 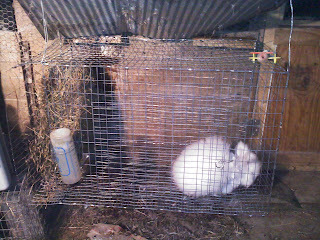 And this is Rewben, my new rew English Angora Buck. As you can see he has plenty of room. The cage is wired to the celling and hangs underneath of another cage. There is a slide made from sheet metal above that lets the droppings move to the back. You can kind of see it in the picture. Yes, I had blisters by the time I was done. And my sweetie had to clip a door for me; but all in all I built them mostly by myself. Now I get a few new bunnies to fill them! !